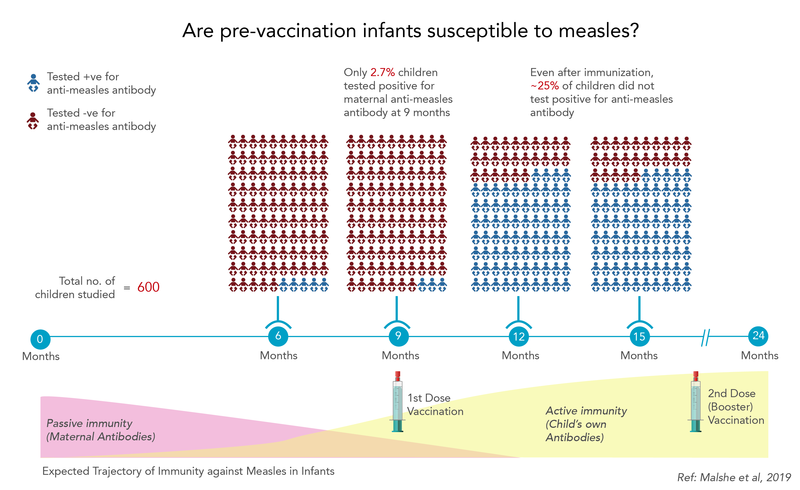 In India, children are vaccinated against measles starting at ~9 months of age. This time is chosen to correspond with the loss of maternal immunity conferred through the placenta or breastfeeding, which protects the infants till then. Now, a new study suggests that maternal immunity may disappear much earlier than predicted, potentially leaving infants vulnerable to infection. In the first year of an infant’s life, maternal antibodies offer protection against most viral infections. This shield of maternal immunity is conferred through the transfer of antibodies across the placenta before birth and through breast milk once the child is born. Generally, maternal antibodies wane over a period of 6-12 months, by which time the infant’s own immune system kicks in, bolstered by standard vaccination procedures. Now, a new study funded by GSK Biologicals and carried out by researchers led by Vidya Arankalle at the Bharati Vidyapeeth Deemed University, Pune, suggests that anti-measles maternal antibodies disappear much earlier than hitherto assumed, possibly leaving infants vulnerable to infection. Vaccination against measles is a core component of the National Immunization Schedule for infants and children. Childhood vaccinations are timed to coordinate with the disappearance of passive maternal antibodies, as the latter interferes with the activation of the child’s own immune response. Currently, the Indian measles immunization regime requires the first dose to be administered at 9 months and the second at 16-24 months. Arankalle and colleagues found that maternal antibodies disappear earlier than 9 months. Based on this, they suggest that the timeline for administration of the first dose be revised to 5-6 months and the second to 12 months. The researchers studied 600 children in total, 150 from each of the following age groups - 6, 9, 12 and 15 months old. The researchers found that at 6 months of age, only 4.7% of the tested infants had maternal antibodies against measles, and by 9 months, this proportion decreased to 2.7%. A 2003 study carried out at Bombay Hospital with a smaller sample size of 23 infants had found 17.39% of the tested children positive for anti-measles antibodies at 9 months of age. Compared to the Bombay Hospital study, the current study suggests that antibody disappearance begins much earlier. Arankalle calls this an early investigational study. “We shall follow up with a cohort of younger, <6-month-olds,” she adds. The study also finds support in another clinical study at a Trivandrum hospital that reported half the number of children presenting measles to be less than 9 months old. Another finding of the study was that 25% of children in the 12-month and 15-month groups were not positive for anti-measles antibody, despite being immunized earlier at 9 months of age, suggesting susceptibility to the virus. 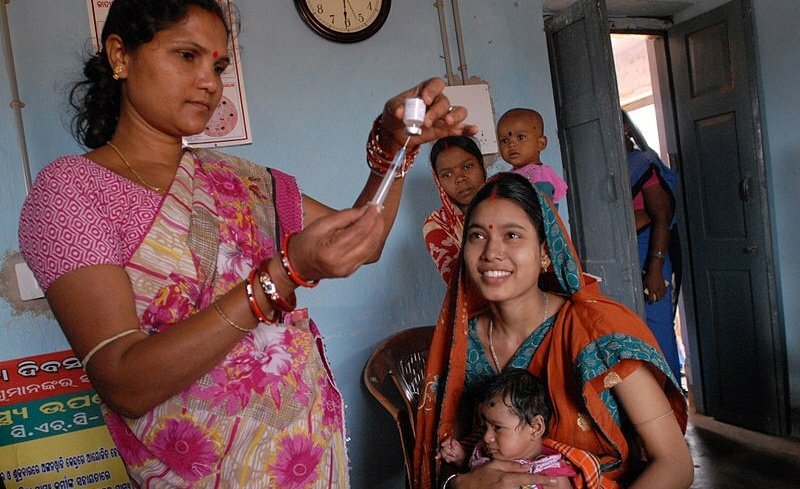 This provides further support for the need to administer a second booster dose of measles vaccine, particularly in a wake of a recent report demonstrating significantly reduced measles mortality in India as a result of the second dose vaccination drive. Sutapa B Neogi, Additional Professor at Public Health Foundation of India (PHFI) (not associated with the study) found the study interesting and speculated that the early disappearance of maternal antibodies in infants could be due to the fact that the mothers nowadays gain immunity not by getting directly infected, but through passive immunization. Such antibodies may have lower placental transfer efficacy. A recent rise in measles cases worldwide can be attributed to the western anti-vaxxer movement (resistance against child vaccination). Anti-vaxxers arm themselves by assuming that all industry funded studies on vaccination are biased. To gain a better perspective of the current study, we asked Arankalle to elaborate on the involvement of GSK Biologicals. However, she declined to comment, stating that this was already disclosed in the paper.